1. Sprouting your grains will neutralize phytic acid and other anti-nutrients which prevent you from fully absorbing the minerals in the food you eat. 2. The vitamin content is increased when you sprout your grain and the act of sprouting will activate the food enzymes found in grains. A sprouted grain contains double the amount of foliate and vitamin B6 than an unsprouted grain and has four times the amount of niacin with a lower glycemic index. These grains can be eaten as is, cooked or ground into flour to be used in baking. The germination of grains changes their nutritional content and in their raw form they will keep their plant enzymes and nutrients. The enzymes and nutrients found in raw sprouted grains aids in the digestion of nuts and seeds and also keeps the colon clean by encouraging the growth of bacteria. They are also high in antioxidants and a great source of protein and fiber while being high in minerals and vitamins. Although hard to believe, cooked wheat can cause constipation and mucus congestion but sprouted wheat can be eaten by people with wheat allergies because the starch is converted into simple sugars during the process of sprouting. The phosphorous found in most seeds is important for healthy bones and teeth as well as for mental abilities and alertness. Different sprouted grains have different nutritional benefits and it is therefore important to add a variety of grains to your diet. Because these grains are already in a predigested form, they are a lot easier for your body to digest than whole grains. To ensure you get all the nutrients and minerals from sprouted grains it is important that you eat the entire sprout with leaves and roots. 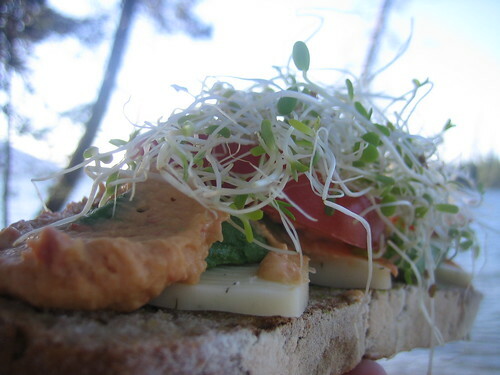 Probably the best way of eating sprouted grains in its raw form is to include them in salads, soups and sandwiches. Bread made out of this grain flour are considered to be low GI which means that your body will digest them slower making you feel full for longer. These breads are also much higher in enzymes, vitamins and protein and the starches found in this grains bread are all converted into natural sugars by your digestive system. The benefits of eating sprouted grains far outweighs the extra time it will take to sprout or buy them. It is recommended that you sprout your own grains in the comfort of your home to make them readily available to you and your family. This type of grain is a relatively easy thing to do and you can store your harvested grains in the fridge for several days keeping them fresh by rinsing them with fresh water at least once a day. Having such an excellent source of nutrients within your reach the only question left to ask is: Why have you not started making your own sprouted grains ages ago? Yummy! I love sprouts and the different blends means you can get subtle favours coming through without having to get toether a mish mash of ingredients...my favourites though are the tried and true mung beans and the blend of onions and radish . I quite happily put a huge chunk on my plate and enjoy them along sie my main meal ....delicious...omg this is making me hungry! Time for quick shop! mmm i love sprouts in my salads!! and its becomming summer salad time... time for sprouts.. yay!! mmmm! I agree! I hate it when yummy summery fuit/veg start popping up in stores but the prices are crazy. His article is good to read. This post assists by offering valuable info.top 5 best fat burner I would certainly suggest others to go through the blog post and obtain your knowledge boosted-up. Adding sprouted grains to your healthy meal plan won’t instantly make you healthier, but little changes (like switching to brown rice or sprouted grain bread) can add up over time to improve your health. Also be aware that if eaten raw, sprouted grains may have a health risk: The warm, moist environment needed to germinate and sprout grains or beans is the same environment that also facilitates bacteria growth. However, cooking sprouted grains will kill any potential bacteria. Fortunately, the more popular sprouted grains, like rice, barley, millet, and wheat, are usually ground up and cooked into bread or pasta, or consumed as a standalone dish. But be careful with sprouted grains that can be eaten raw, such as sprouted chickpeas in hummus. How to Stream stream to chromecast from vlc An Step-by-Step Guide to Casting from VLC to Chromecast! What is 1 plus 1?